[RUMOR] There are rumors in the paddock that Jock Clear will become Charles Leclerc‘s race engineer at Ferrari next year. Speaking good English isn't helping Seb at all. Maybe learning a little "Enzo" might be just what Leclerc needs to hold the #1 spot next year! I wonder how Lewis' German is ? 80 Poles!! Hitler was Austrian also. I forgot the Merc cars are mfg. in Italy! I guess it's brave. Taking a chance on a young guy after all this title winning lately. I agree. The chance is will Seb move over if Charles is doing a WDC job after a few races? Or at least race each other with no team orders. Ferrari moved Kimi out for Seb, I wish the same now. Move Seb out for Max. Your right! Thinking Seb will move over for either Max or Leclerc is silly. He's Schumy Jr. So 2019, only Merc DNFs will allow Ferarri WCC. seriously Brembo enoughs enough of your grudge posts about team orders. Getting so boring and tiring reading them, making mind up about leavng this forum, as not alot here anymore, and yet again your awesome posts are pushing me nearer. Now that's boring for sure! Ferrari getting the cars ; [plural] up close as can be to Merc; with no results as far as pole, or winning is real hard to accept for any true Ferrari WCC fan. Changing what was needed to get the cars in winning shape is pretty well done. So next year Ferrari is also changing a driver . Next race Austin, Kimi on pole with Seb along side him would be great. A mistake by Seb causing a Lewis DNF would make for a busy race to watch. Last edited by Brembo; 14th October 2018 at 12:11. Even if you are right about everything you say (let's face it you're not), repeating yourself is not going to make a difference, you're just making yourself a silly person of this forum. Understand, Ferrari is not going to change anything just because a "brembo" is acting like a begrudged lil housewife her husband is not buying here the shoes she wants ! In the beginning Charles will be expected to be in a learning role and support seb. That is fact. It is true for Ferrari and it is true for all teams when one is a WDC and the other is a rookie. 1. Settle in that role and wait his time, learn and support Vettel. 2. Fight for his place and earn the right to challenge for the WDC as Lewis did against Alonso. Number 2 will be helped by how Vettel performs next year. It takes one to know one! Very noble of you coming forward, Aroutis, buy her the shoes already! I remember weeks at a time here just reading posts about tires; over and over, color after color, being the only thing that will get a driver a win. If it helped letting it out to get to the next race, what's the problem? Also posts talking about 2019 already as the only hope is not that cool a read either. Watching Max and Leclerc each race makes F-1 still great, even though we know who is way up front. BTW, if it's boring, "Don't read it!" Calm down and get her the shoes, you will feel better in the morning! Last edited by Brembo; 15th October 2018 at 10:08. Happy birthday to our future World Champion who turns 21 today! 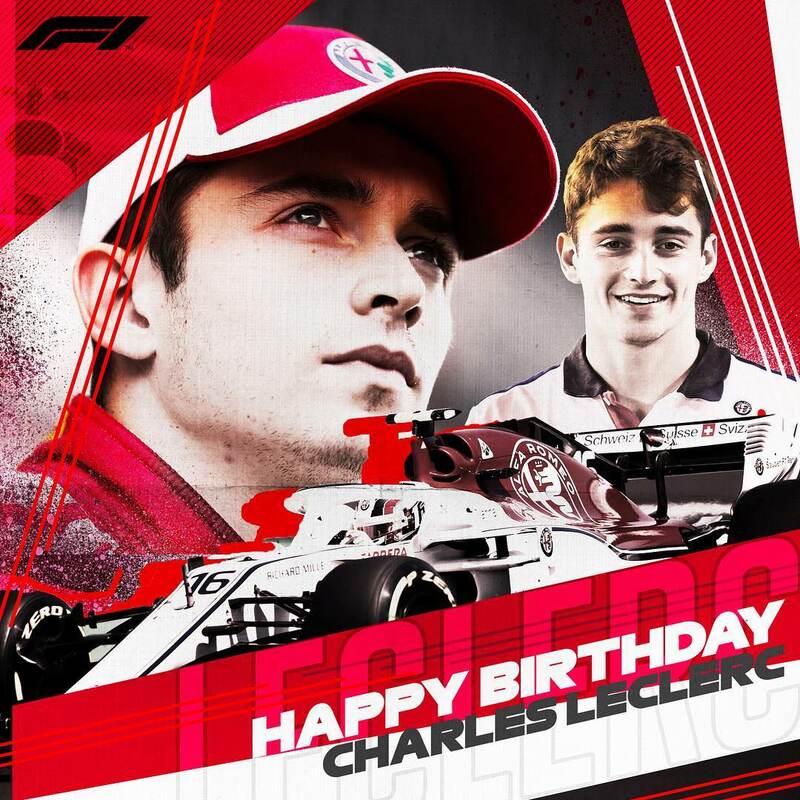 Happy Birthday to our next Ferrari legend. Can't wait to see what he can do with SF. It's not me that acts this way. It is you! So go ask someone to buy you the shoes already. P.S. in case you have not noticed, it's not just me that asks you to just stop acting like that. Perhaps you need to consider this. You are getting very tiresome with this act. Ok, we know why you act like that. But grasping at the whole brazilian team mate saga is not helping you. They're the past, they're gone, bye bye already. What happens with Leclerc remains to be seen. Actually same goes with Max, and pretty much everyone that drives (currently, and in the future) for F1 teams. However, and as much as you may not like it (Ferrari really does not give a flying damn) , you know what the drivers are , and you're supposed to support them. That is if you are a tifoso. You are right for sure , Michael and the rest are past , gone by by already, no need to see their names here it's 2018. And I agree with you again were supposed to support and respect all the drivers, even Kimi if you are tifosi Ferrari. Fans here saying their dying for Ferrari to get rid of Kimi for Leclerc ASAP is not cool at all. Besides disrespectful it's boring and tiresome to read. On to the next race !! Even if seeing Lewis win is as boring as my posts! Last edited by Brembo; 16th October 2018 at 17:39. And for once again, you need to bring what hurt you the most, Michael. So predictable. But yes, you do need to support the drivers, since they are part of the team. And if Merc wins, so be it, we will move on. Boring, or not, this is racing. Of course, feel free to go support another team, hey, I believe RBR is where Max is racing ! Thanks for giving me permission to go to Red Bull! I think that Ferrari will get Max as soon as they can, so I'll stick with the best, Ferrari. Merc would be crazy letting either driver go any time soon; even though fans here would welcome Lewis with open arms; just as they mostly did when Seb came over #1 finger in the air and all. I'm hoping for Kimi to get a win before he leaves Ferrari! Go Red Bull!, Ups! I meant Ferrari!! Don't be silly, Brembo, some of us would be mortified if Lewis ever came to Ferrari, I would welcome Max as an alternative in the future because I'm sure Lewis would be too busy promoting his clothing line and mixing with nubile singers in a state of undress. I think you need to take a chill pill and hope that Max will one day thank you for your support. Wisepie, I'm sure you had to know already I was being silly, just joking. I'm just trying to relieve the "Bordom" here. A Kimi win in Austin will be great ! I reckon that would last for about 5 minutes or so. Enjoyed every second of this. I would like to say 'over my dead body' which I suppose means the same thing! I don't dispute his ability but there are a number of reasons why he appears to be the best of the current crop of drivers, not least the car he's had for the past 5 seasons and the ease with which he's been able to capitalize on that situation. I would struggle to accept him in red for 5 seconds.